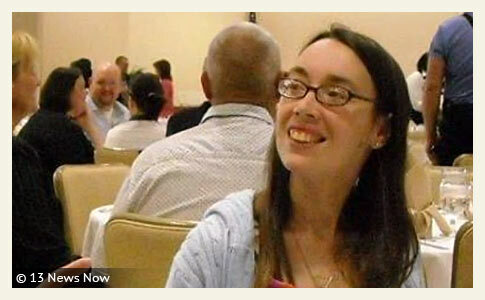 Suzanne Story, 36, was killed by a pit bull-mix given to her a few weeks earlier. UPDATE 02/12/16: Yesterday, we learned from The Virginian-Pilot that the advertisement for the dog was actually placed in The Pilot. A stroke of good luck in the ability to track down the former owners of a pit bull-mix that was off-loaded to Suzanne Story then killed her a few weeks later. “There was blood everywhere,” her mother Debbie Brown said. “Her hair was just soaked -- solid blood -- just covered in blood.” The first edition article was later replaced by this evening update. The pit bull named "Buddy" was a 1.5-year old male pit bull-mix, not a female as previously reported. Story had been cleaning the dog's crate, when the animal suddenly attacked her, ripping open her throat. Her sister and roommate Robin Ross was in the house and heard her screams. She was able to pull the dog off Story -- amazingly -- and lock it in the bathroom. But the dog broke a hole through the bathroom door and continued attacking Story, executing the killing bite. We pause now to remind readers of the 1.5 to 2-year old rule about these dogs best expressed by former Lucas County, Ohio Dog Warden Tom Skeldon in 2008. This is the age that pit bulls reach sexual maturity. "[The owners] all think that these pit bulls are nice sweet animals and some of them are, but by the time they get to be a year and half or two years old," Skeldon said, "they're pretty intent on what they're bred to do and that’s grab ahold of things and shake it until it's dead." This is well known amongst many animal control officers and humane groups, but a fact rarely shared with the public. It is hardly surprising that the most common age of unwanted pit bulls in open admission shelters is 1.5 to 2-years old.1 The aggression has shown up exactly as Skeldon described. The "lucky" owners have had close calls with their animals or children in the household. Then it is "off to the pound" for that pit bull -- or in this case offloaded to an uninformed innocent. The Pilot published the advertisement that Davino purchased. “Pitbull & Boxer Mix-Very good w/kids, people. Male. 1 yr. old on Sept. 13. $100.” Davino said she had intended to give the dog away for free, but was reminded by The Pilot that it was a bad idea. "A sales rep told her to put down a dollar amount to make sure people were serious and the dog would be taken care of," states The Pilot. After arriving at Story's house, they gave her the dog for free, as intended. After The Pilot published the story, a user with the alias Mike Brown left several comments. We have no idea if what he states is true and we have no sympathy or respect for alias Brown either. We have no sympathy or respect for ANYONE breeding pit bulls in an era when nearly a million3 unwanted pit bulls are systematically euthanized each year and countless others are pawned off to the uniformed then traded "like playing cards" to find a home where the dog won't kill something. "I agree. I bred this dog and am shocked but at the same time I'm not. He wasn't a toy. He was a living soul that couldn't talk. He probably was upset and wanted to go home. I'm just glad this story isn't about me or my family. I had offered to take him just 1 week ago." "I bred this dog. He was American bulldog/pittbull mix. I had just watched him for the owners over the holidays for 2 weeks. In that time he was not aggressive but it was clear he was not trained. I had told the owners 1 week ago if they were going to get rid of him I would like him back. They had wanted to get rid of him after he picked up there small dog and had the dog in his mouth. I only can say that his brothers and sisters are good dogs. His parents are also great. This dog should not have been bounced around. First to me for 2 weeks then only a few weeks later given away. Buddy just wanted to go home. He had just been abandoned 3-4 weeks prior. I'm sure that played a huge roll. I feel terrible about this. Another crazy coincidence is I believe she had a brother that works for me that is in jail rite now. They don't know each other but have the same dad. I can't confirm this but there last names are the same and the age is very close. If this is true then her brother at one point had the dogs sister from the same litter. Man this is sad sad news. I will answer any questions related to buddy." "How am I ignorant? I saw there was a problem and offered to take the dog back. The lady should have just given him back. I wasn't going to give him to someone else. Man if I woulda known this dog would have been bounced around like this she never would have gotten the puppy. Unfortunately you can't see the future. There are 6 more brothers and sisters of Buddy. Whoever bought a bully pit in the neighborhood of redwing off oceana and general booth around November 2014, you probably bought one of his siblings. Please be safe and call me if you need to find him a new home." Despite alias Brown claiming Buddy's siblings are "good dogs," his brothers and sisters are now squarely in the 18-month old period too. Who knows what might happen? Remember what Skeldon said -- some will remain good and others will not. Shuffling a dog from home-to-home is a never a good idea for the animal, but its no excuse for unleashing a massive attack, killing its new owner either. "Please be safe and call me," Brown wrote, but he did not leave a phone number. The photograph series taken by The Pilot of Story's family after her death is heartbreaking. 02/10/16: Advertised as "Pit Bull"
13News Now interviewed Suzanne Story's stepfather Randy Brown. He said that she saw a newspaper advertisement about a "female pit bull" that was placed by someone in Virginia. The "off-loaders," who offered the dog for free, drove to Story's home in Perquimans County and delivered the dog that would violently attack and kill her a week later. The off-loaders told her the dog was gentle and good with children. Brown thinks the people knew the dog was dangerous. Story's neighbor, Jonathan Nash, told 13News Now he was concerned the first time he saw the dog. "I saw her walking the dog. The dog was really pulling her and she was struggling to maintain control from her driveway to her front door." He added, "I started to worry about my little one. If the dog gets out, what is he going to do?" Nash said. Family members say Story was cleaning the dog's crate when the animal attacked her. Story's sister was there, but could not stop the attack. Brown vowed to find the off-loaders of the dog with the help of an attorney. Yet the whole situation is sketchy -- seems doubtful the previous owners will be easy to track down. However, they did place an advertisement, we hope in a paid newspaper, leaving a credit card trail. God help anyone who agrees to take a pit bull free of charge whose owners drive across state lines to dump the dog at your door. Story leaves behind two daughters ages 15 and 17-years old. We pray for them both. Perquimans County, NC - A North Carolina woman is dead after being viciously attacked by her pet dog, described as a pit bull-type dog. Perquimans County Sheriff Eric Tilley said the attack occurred about 1:00 pm Wednesday in the 1200 block of Snug Harbor Road. Her injuries were so extreme, a helicopter from Sentara Norfolk General Hospital in Virginia was sent to airlift her to the hospital. The victim, Suzanne Story, 36, died as the helicopter was landing, Sheriff Tilley said. On the 13News Now Facebook page post, they state, "The woman's mother said her daughter got the dog about a week ago after seeing an ad in a newspaper that she was good around small children. We're working to get more information…" As far as the breed mixture goes 1.) It will be interesting to see what the newspaper ad said, and 2.) There certainly appears to be olde English bulldogge, pit bull and Johnson or Scotty-type American bulldog; all dangerous gripper breeds. The victim's stepfather, Randy Brown also of Hertford, posted on his Facebook page about an hour ago, "MY stepdaughter got killed today by a pit. The people that raised this dog need to be held responsible, because they lied about the nature of this dog. I will pressure the issue. Randy Brown." Suzanne Story was the mother of two. Her Facebook photo album shows a variety of pet cats, dogs and other animals, as well as pit bull awareness memes. She was very animal friendly. 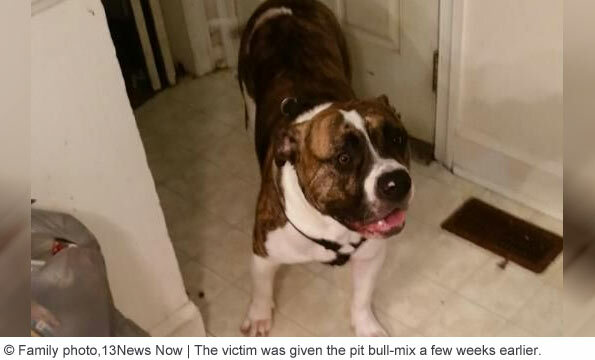 In 2012, a 10-month old boy was fatally attacked by a family pit bull-mix in Perquimans County. 2They stated in the video, however, that they called the phone number in the advertisement and they were sent to an "unnamed voicemail." That's all we know. "The people that raised this dog need to be held responsible, because they lied about the nature of this dog." The family needs an attorney and they need to initiate the lawsuit now. Who is breeding the dogs that kill? I've said it before; BREED research prevents Darwin attacks. She was the typical target audience for pit bull propaganda-young, female, white, gullible. It only takes about three minutes of internet research to figure out how dangerous pit bull type dogs are. Just yesterday during one of my classes, I heard the professor in the class next door playing that disgusting video where dog fearing people play with some pit puppies for a few minutes. The people were saying stuff like "Look at these little guys. I KNOW they'd never hurt anyone". I think it was horrible for the professor to play that highly biased pit pushing video, but that's not the main point. It makes me think of this situation. Why do people think that if a dog is sitting quietly for 5 seconds that it's totally safe? Yet then, if they hear something like this, stories of people taking in dogs said to be harmless that later kill them, it must be because the person did something wrong. I just don't get it. If I hear a story of an animal with the capability to kill, I don't care what anyone else says or about playing with puppies or anything else. I'm not going near one of any age with a 9 1/2 foot pole. This woman looked just like the kind of typical innocents who fall for pit pushing propaganda. Yet the information of how dangerous they are is perfectly available. I'm so sorry this had to happen to her and to her kids. Prayers for them. I agree with both of you joelande and Ka D. It's a combination of false advertising and lack of research that's getting people killed and it needs to stop. I went to school with the ex-husband (and father of her children) of this poor woman. Just DAYS before she was killed the ex was posting pro-pit bull videos. She is absolutely a victim of the propaganda. You're so right. It's everywhere. I completely believe the dog had not been a problem before. In this article the dog is stated to be 1 1/2 years old. Having assisted in a lot of dog training classes that is the typical age that pit bulls start to flex their genetics. There are the clueless owners coming to class with the dog that they "socialized and raised with love" is now dog or animal aggressive. I see no responsibility on the former owners part. Caveat emptor. I hope this lady's family has a good lawyer. And that, for once, the pit bull propagandists are named in the suit. If the previous owners saw any signs of aggression before they gave this dog away, they sure as hell won't be admitting to it now. I want to know is how CAN the buyer beware, if 99% of the "pit bull information" floating around is total pit pusher BS? "They don't understand and people fear what they don't understand. We will never know why it happened but it did I know Suzanne would not want to blame the breed for what happened. She had a big heart for everything. I will miss our talks and walks together I already feel the void of her not being there. I hope you can ignore the negativity of the people that don't know you or your family." Reading bully dog books by Richard Stratton, Joseph Colby, carl Semencic and Douglas Link will tell you the same about age of maturity. Most recommend that you don't "start" your pit until he's 18-24 months of age. That's the point that you let him begin to fight. Best dog to train with is an older pit who's not too hard biting. The goal is to let him practice, not kill him. Let him get banged up a little, but stop the "roll", letting him "wanting more". "Good, game-insane" bully dogs will be struggling to continue even after the dogs are separated. Buddy simply became a good game-insane bully dog that day. They knew the birthdate so it came from a breeder. They knew it wasn't a boxer cross. They knew this was a violent dog. The media and law enforcement need to track this dog back to the breeder. The buyers of his other dogs need to know they are in great danger. Her parents need to sue on behalf of those motherless children. Until pit bull advocacy puts its focus on breeder regulation, they are just enablers and assistants to the breeders. The newspapers and classifieds are also enablers of this. I know I say the same thing every time I post here, but…what a way to die. It's like something out of a horror movie. The pit bull BROKE A HOLE in the door (we've all seen the photos of pits doing this in other attacks, and it chills my blood every time) to complete killing Story. OF COURSE the dog was problematic/aggressive and that's why the previous owners wanted to get rid of it for free, through the classified ads, instead of dropping it off at the pound–because they knew he'd FAIL a temperament test and be euthanized. Oh noes, we don't want pitty's blood on our hands, or to admit we made a mistake! No lawsuit will be forthcoming, however well-deserved. The previous owners are almost certainly damage-proof. Unless the victim's family has enough money to sue them purely in pursuit of a verdict, it's not going anywhere.